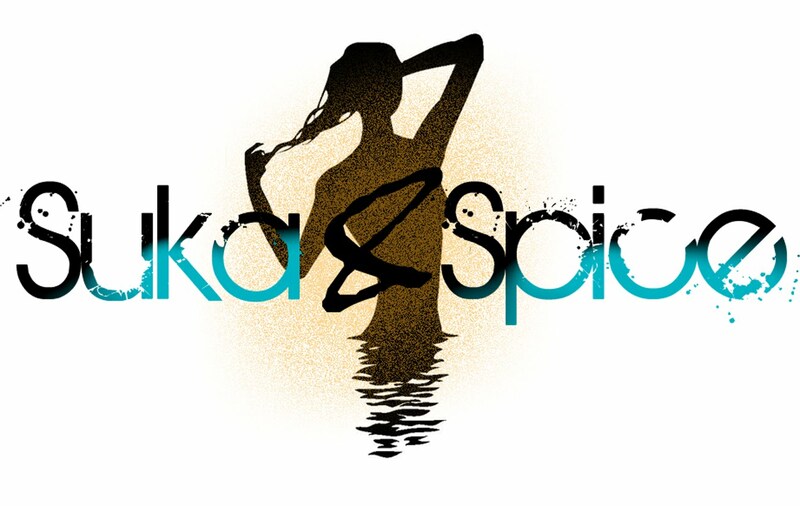 Suka & Spice™: Jin Soon Choi, Liner, and...What? Jin Soon Choi, Liner, and...What? My most recent stop at MAC resulted in a Jin Soon Choi nail polish purchase. I was looking forward to one color in particular, and that would be the shade Dry Martini. It's a moody, fatigue-like tone that reminds me of olives in a martini--hence, the name. It's a nice diversion from the similarly muted greys that we've seen this past year. Of course it was a bit difficult to leave with just a dinky polish (I've fallen for so many of their polishes, only to be let down upon returning home--so you know, needed some padding here), and consequently picked up the Pearglide Eye Liner in Black Russian (Love That Look collection). 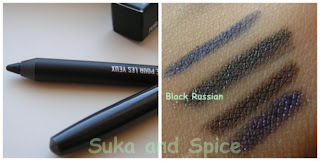 I absolutely love this formula, and would gladly have MAC formulate all of their liners to be this soft--lip liners included! It's not uncomfortable to glide along the waterline, and the color reminds me a bit of Sharkskin. Of the four limited liners, it had the most appealing sparkle--not too much, and not too little. Want to see something funny? 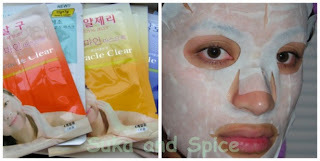 I picked up a boatload of Korean sheet masks a few weeks back. They're pre-moistened (with serum) sheets that stick to your face and perform whatever each one claims to do. I wasn't sure that anything would fit my big head, and decided to try the Apricot one the other night to scare the hubby. I bounced off the stairs like a confused Ninja, and he took the opportunity to capture it on camera (which happened to be laying on the living room table--my fault for leaving it there!). I actually like these things, and now that I think about it, I'm off to apply the royal jelly one! Now you know I'm an honest blogger! Did anyone snag a Jin Soon Choi polish? Have you tried sheet masks before? Dry martini is such a cool name! lol, I haven't bought any of them yet because I'm cautious when it comes to MAC polishes, what's the consistency of this one like? Haa haa I love your description of the bouncing ninja, I'll have to try that on someone soon! I love anything with Royal Jelly in it- have to try that!! Great haul!! And so funny.. i laughed at the ninja bit like a loon!! @nadine: it keeps things interesting! @tali: me too! they have heaps of it in New Zealand, so I try to stock up when I'm visiting...have you tried those mask sheets? they're interesting! 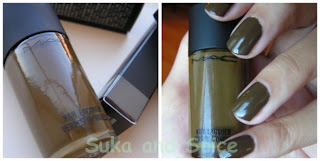 I'm not a polish person but I'm defo hoping to get this khaki nail colour from MAC, defo. I love Asian sheet masks, i've been reading their reviews on lipglosseater.com , she uses them a lot. I think I may just feel obliged to order a batch too. where did you get yours from? I got an aqua sherbet one as a freebie when I placed an order a while back. You just reminded me! You are tagged for a blog award in my blog! @su-pah: i will check out lipglosseater for her reviews..thanks for the link :) i picked mine up from the korean mart here (where i find the other cosmetics)..but aqua sherbert--i didn't see anything like that! @lise: it's a definite change from the normal pinks and reds! @catanya: i'm going to check it out now! thank you! I love the cloth face masks! Anytime I get a chance to hope over to Asia I buy a few. My faves are the CQ10. Cute blog!